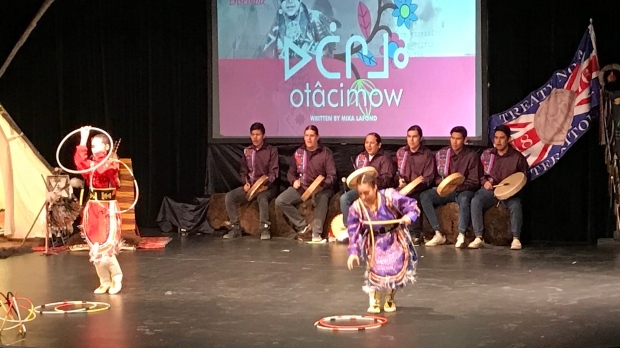 First Nations and Metis history in Saskatchewan is being showcased in this year's Saskatoon Public Schools Indigenous Ensemble, called Otâcimow. The ensemble written by Mika Lafond is narrated by a little boy and his grandmother who teach audience members the history of Treaty 6 territory. “There’s a little bit about how our dances and ceremonies and our stories were actually illegal for a time,” Lafond said. High school students from across Saskatoon are using dance, song, storytelling, and traditional art to tell the story. “Now that (our dances, ceremonies, and stories) are allowed to be practiced, we can teach our youth. I think it’s important that they know that they can be proud of who they are, proud of their identity and proud of their culture,” she said. Otâcimow will have four daytime performances at Aden Bowman Collegiate for students and staff members from Saskatoon Public Schools. There will also be an evening performance on Tuesday, April 16 for the public to attend.